Use all your skill to stop the smiley ball from escaping the screen! Use all the tools available but be careful to stick within your budget. 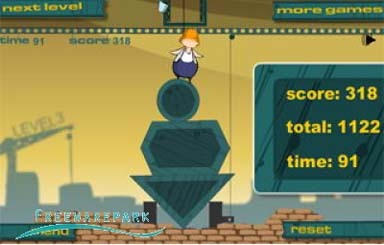 Use your magnetic crane in this fun physics puzzle game to load the containers into the ship. Load them carefully though, their different weights puts them off balance easily! Use your magnetic crane to lift the metal blocks and then drop them to build tall structures. Stack them high and make your structure reach the target height for each level. This Jenga-inspired online physics game is a real test of your balancing skills. Remove shapes from the tower and stack them on top without collapsing everything! Stack objects on the screen to protect your orange balls. Shield them from the spikes that fall from the passing evil cloud. This is an ultimate game of logic incorporating classic stacking techniques. Place all of the coloured squares in the right place, but careful not to block your own path! Move and stack jelly shapes to build towers of jelly. Quick, the jelly monster is getting hungry! Drag the shapes on screen and use all your balancing power to make the ragdoll touch the chip for at least 5 continuous seconds. Careful your shapes donÃƒÆ’Ã†â€™Ãƒâ€ Ã¢â‚¬â„¢ÃƒÆ’Ã¢â‚¬Å¡Ãƒâ€šÃ‚Â¢ÃƒÆ’Ã†â€™Ãƒâ€šÃ‚Â¢ÃƒÆ’Ã‚Â¢ÃƒÂ¢Ã¢â‚¬Å¡Ã‚Â¬Ãƒâ€¦Ã‚Â¡ÃƒÆ’Ã¢â‚¬Å¡Ãƒâ€šÃ‚Â¬ÃƒÆ’Ã†â€™Ãƒâ€šÃ‚Â¢ÃƒÆ’Ã‚Â¢ÃƒÂ¢Ã¢â‚¬Å¡Ã‚Â¬Ãƒâ€¦Ã‚Â¾ÃƒÆ’Ã¢â‚¬Å¡Ãƒâ€šÃ‚Â¢t fall! Try to topple all the coloured shapes so that they fall off the screen in 45 levels of this addictive anti-stacking game! This is the ultimate stacking game and really needs your best balance techniques! Balance all the shapes on the existing shapes on screen without any of them falling off screen. Expand the blue shapes in the correct order to make one of them stay above the rope. Increase their size through a total of 30 levels! With 3 different game play modes, this classic stacking game is sure to keep you addicted. Stack the cakes as high as you can and then control the king as he is catapulted high to eat as many of the sweet treats as possible!